For the fourth component, you will augment your frontend to allow users to register/login, and save generated memes in Firebase. It is not required that you use an IDE, but it’s a really really really really good idea. JetBrains’ IntelliJ/WebStorm is a great choice — if you already have IntelliJ you can add the NodeJS component to it, or simply download WebStorm. You can get a free license to use any of the JetBrains IDEs by filling out this simple form. 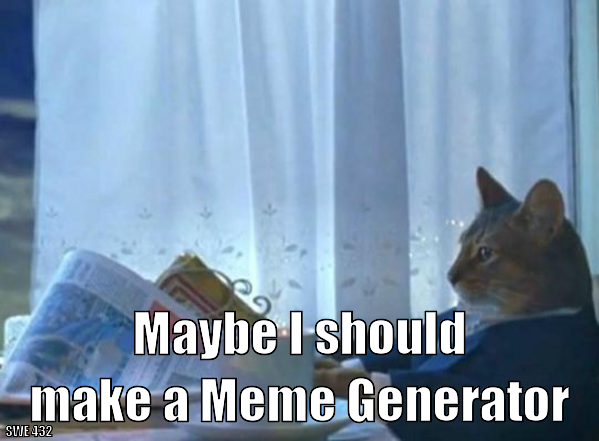 Users can “favorite” memes (that they have generated or that others have generated) and view their favorites. Copy your Firebase configuration into firebase.js. In the firebase console, under authentication, enable email/password signin. We have configured the handout so that certain components are only available to the user when they are logged in, and to redirect the user to a login page if not logged in. You should implement your entire login functionality using Firebase’s email/password authentication. The rest of the application will detect that the user is correctly logged in once you succeed in performing the login with Firebase. You can access the firebase auth component through the reference firebase.auth. If a user tries to sign in and there is no account with that email, then an account should be automatically created. If there are any errors returned from firebase during registration/sign up, be sure to display that error to the user in a react-bootstrap Alert. Whenever a meme is generated (but not including when the default template is generated), the meme should be recorded in Firebase. You should store it by recording the template name, and the text that is applied to that template (do this in MemeGenerator). Implement the MemeList to display the list of all generated memes (sorted by creation time, descending). It should paginate the list of memes, only showing a maximum of 10 memes per page. You might find the Pagination component useful. Use Firebase’s onSnapshot call to fetch the data, and once it’s fetched, store it in your MemeList’s state. Make sure to unregister any onSnapshot observers that you create when the MemeList is unmounted. The onSnapshot method returns a method that you can call to cancel the observer — you should store this method for later use (to cancel the observer). Otherwise, you will leak resources. Update your MemeList to display a favorite/unfavorite button for every meme. From the main page (which you implemented in part 2, and displays all of the memes), users should be able to select to favorite any meme (and if it’s already favorited, then to unfavorite it). Update your MemeList to take into account the this.props.isUnfiltered property. If this property is set to false, then you should display only memes that the user has favorited already (this is what is rendered when selecting “View Saved Memes”). Note: You should consider each generated meme as a target for favoriting – so, if there are 3 memes with the same template name and same text, a user could choose to favorite each one individually. Your meme generator will be graded by hand (as described in each section above). When you submit to Autolab, it will not grade your submission at all. We will grade for correctness on the above points — and you should test your functionality by hand as well. To prepare your code to be submitted, run npm pack in the assignment directory. This will create an archive thememebase-4.0.0.tgz – this is what you will submit to Autolab. Do not try and generate this archive without using npm; it’s highly likely to cause Autolab to reject it.